Harvey Dent:"Carbon fiber, .28 Caliber, made in China. If you want to kill a public servant, Mr. Maroni, I recommend you buy American." Mobster:"So what are you proposing?" The Joker:"It's simple. Kill the Batman." Alfred Pennyworth:"Did you get mauled by a tiger?" Bruce Wayne / Batman:"It was a dog." Bruce Wayne / Batman:"It was a big dog." Lucius Fox:"You think that your client, one of the wealthiest, most powerful men in the world, is secretly a vigilante who spends his nights beating criminals to a pulp with his bare hands. And your plan is to blackmail this person?" Alfred Pennyworth:"Some men aren't looking for anything logical, like money. They can't be bought, bullied, reasoned or negotiated with. Some men just want to watch the world burn." Harvey Dent:"You can't. You can't give in. You can't give in!" The Joker:"This town deserves a better class of criminal, and I'm going to give it to them." The Joker:"Let's wind the clocks back a year. These cops and lawyers wouldn't dare cross any of you. I mean, what happened? Your balls drop off?" 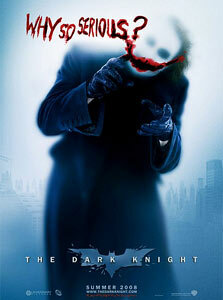 The Joker:"Starting tonight, people will die. I'm a man of my word." The Joker:"Excuse me, I want to drive!" Bruce Wayne / Batman:"People are dying Alfred. What would you have me do?" Alfred Pennyworth:"Endure, Master Wayne. Take it. They'll hate you for it, but that's the point of Batman. He can be the outcast. He can make the choice no one else can make. The right choice." The Joker:"A little fight in you. I like that." Alfred Pennyworth:"I trust you don't have me followed on my day off." Bruce Wayne / Batman:"If you ever took one I might." The Joker:"If you're good at something, never do it for free." Bruce Wayne / Batman:"Don't let me find you out here again." Fake Batman:"We're tring to help you!" Bruce Wayne / Batman:"I don't need help!" Jonathan Crane (The Scarecrow):"Not my diagnoses." Harvey Dent:"You either die a hero, or you live long enough to see yourself become the villain." Fake Batman:"What gives you the right?! What's the difference between you and me?!" Bruce Wayne / Batman:"I'm not wearing hockey pads!" Alfred Pennyworth:"I suppose they're going to lock me up as well, as your accomplice." Bruce Wayne / Batman:"Accomplice? I'm going to tell them the whole thing was your idea." Lucius Fox:"Perhaps you should read the instructions first?" The Joker:"Now, our operation is small, but there's a lot of potential for 'aggressive' expansion. So, which of you fine gentlemen would like to join our team? Oh, there's only one spot open right now, so we're gonna have tryouts." The Joker:"And I thought my jokes were bad." The Joker:"Good evening ladies and gentlemen!" The Joker:"Good evening ladies and gentlemen. We are tonight's entertainment!" Lucius Fox:"Now for high altitude jumps, you're going to need oxygen and stabilizers. Well I must say, compared to your usual requests, jumping out of an airplane is pretty straightforward." Bruce Wayne / Batman:"And what about getting back into the plane?" Lucius Fox:"I'd recommend a good travel agent." Bruce Wayne / Batman:"Without it landing." Lucius Fox:"Now that's more like it Mr. Wayne." Alfred Pennyworth:"Know your limits Master Wayne." Bruce Wayne (Batman):"Batman has no limits." Alfred Pennyworth:"Well you do sir." Bruce Wayne (Batman):"Well, can't afford to know them." Alfred Pennyworth:"And what's going to happen on the day that you find out?" Bruce Wayne (Batman):"We all know how much you like to say 'I told you so'." Alfred Pennyworth:"On that day, Master Wayne, even I won't want to. Probably." The Joker:"Why don't we cut you up into little pieces and feed you to your pooches. And then we'll see how loyal a hungry dog really is!" Harvey Dent (Two Face):"Heads, you get to keep your head. Tails, not so lucky." The Joker:"How about a magic trick." The Joker:"It's not about money. It's about sending a message." Harvey Dent (Two Face):"You're not playing the odds, friend." The Joker:"It's all part of the plan." The Joker:"Oh you wanna play? Come on!" The Joker:"Want know how I got these scars? My father was a drinker and a fiend. And one night he goes off crazier than usual. Mommy gets the kitchen knife to defend herself. He doesn't like that. Not one bit. So, me watching, he takes the knife to her, laughing while he does it. He turns to me, and he says, 'why so serious?' He comes at me with the knife. 'Why so serious?!'. He sticks the blade in my mouth. 'Let's put a smile on that face!' And why so serious?" The Joker:"Well, you look nervous. Is it the scars? You want to know how I got 'em? Come here. Hey! Look at me. So I had a wife, beautiful, like you, who tells me I worry too much. Who tells me I ought to smile more. Who gambles and gets in deep with the sharks. One day, they carve her face. And we have no money for surgeries. She can't take it. I just want to see her smile again, hm? I just want her to know that I don't care about the scars. So I stick a razor in my mouth and do this to myself. And you know what? She can't stand the sight of me! She leaves. Now I see the funny side." The Joker:"All right. So, listen. Why don't you give me a call when you want to start taking things a little more seriously." The Joker:"Let's put a smile on that face!" Gotham National Bank Manager:"Oh, criminals in this town used to believe in things. Honor. Respect. Look at you! What do you believe in, huh? What do you believe ?!" The Joker:"I believe whatever doesn't kill you, simply makes you stranger." Alfred Pennyworth:"Will you be wanting the Batpod, sir?" Bruce Wayne / Batman:"In the middle of the day Alfred? Not very subtle."